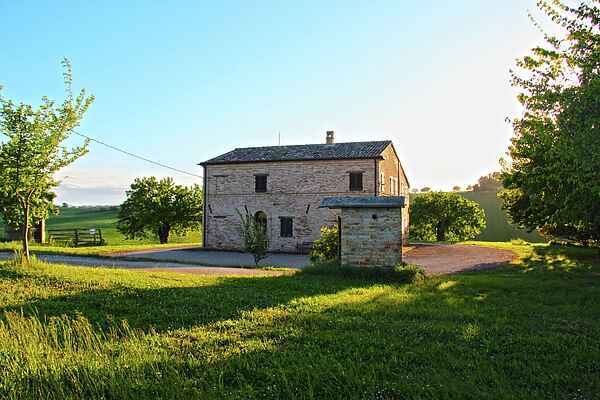 The Lucangeli farm is in the beautiful Marche region. It is a magnificent estate and at an elevation of 300 metres. The landscape is characteristic of the region with delightful hills and valleys leading towards the Adriatic Sea. The estate covers 190 hectares. Twenty hectares are devoted to vineyards. The farm has four cottages which are between 100 and 150 metres apart. The Montelipa House is one of them. It is spacious, has rustic furniture and is full of atmosphere. You can see the mountains and the green hill around from the house. The estate is perfectly positioned for exploring the Marche region. You can reach a wide variety of interesting places easily from here. These include the Monti Sibillini National Park, many picturesque medieval villages and the towns of Treia, Cingoli, Loreto, Recanati and Macerata. The Adriatic Sea is also well worth a visit. The estate produced fine wines. For example Rosso Piceno DOC Rosso Piceno Bulcinao DPC and Monelipa Maceratesi Rosso DOC Colli. Stop by the winery and go join a wine tour and wine tasting. Take a look at the Duomo di San Giuliano. Beautiful church in Macerata. You can also make a nice walking tour in Macerata. The Pizza della Libertà is a romantic square with nice cafes. At Osteria dei Segreti Verde Fiore 41 Appignano can you dine. The offer is authentic with novelties. For example, homemade pasta with truffle sauce and polenta with porcini or baccalà. There are also prestigious wines that ensure proper harmony with the food. Delicious! For a delicious pizza you have to be at Le Grazie Pizzeria Via Tiziano 4/6 in Appignano.